Jade has been the most treasured gemstone in China for thousands of years. Considered indestructible and immortal jade has a powerful influence in Chinese art and culture. Back in the Han dynasty emperors were buried in suits made of thousands of tiny rectangles of jade sewn together with gold wire in the belief that jade would preserve the body. Examples of these magnificent suits can be found in Nanjing and Hefei, Anhui (Liu Sheng's tomb). 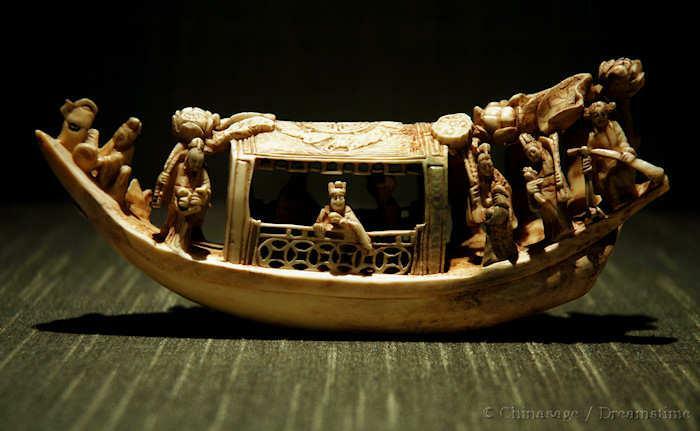 Fine jade ornaments found in Liaoning from 3500BCE and Jiangsu from 2500BCE, show the very long history of working in jade. Ancient jade was made into circular disks (bi ➚ 璧) with a central perforation which symbolized heaven; whereas the jade ‘cong’ 琮 (a square outline encasing a cylindrical hole) symbolized earth. Traditionally, a rod of jade was given when someone reached the age of 70. It was called a jade scepter 玉杖 yù zhàng or dove staff 鸽杖 gē zhàng and measured one foot long with usually a dove carved at one end as the dove symbolizes longevity. Ceremonial insignia of office in ancient China include the jade scepter (ruyi) and spear (戈 gē). In many ways, jade in China holds the same rank as gold and diamonds in the West, it is also highly prized in other countries in Asia; Central America and Australasia. True jade comes in a variety of colors and is either the mineral jadeite or nephrite. Fashions in jade come and go, with different colors gaining popularity, currently white or cream jade is the most highly prized. Cream or white jade is often called 'mutton fat jade' and symbolizes purity. Jade according to legend came from holy mountains, and nephrite was mined for centuries in the Kunlun mountains near Hotan, on the south side of the Turpan basin in Xinjiang. Boulders of jade can still be found on the banks of the Karakax and Yurungkash rivers there. The most common color of the Jadeite form is light green that comes mainly from northern Burma. Qing Emperor Qianlong so loved the lustrous green jade from Burma that he launched three unsuccessful campaigns to take over the mines. Most of the things he touched were required to be made of jade. To this day the supply of jade comes mainly over the mountains from the mines near Hpakant ➚ - a very profitable operation controlled by the Burmese military. The character for jade 玉 yù shows three pieces of jade strung together that are said to represent virtue, beauty and rarity. The addition of the dian (dot) stroke completes the character and distinguishes it from 王 wǎng the character for monarch, while still illustrating the kingly connection. The modern form of the character for kingdom is 国 guó which has the jade character enclosed in a boundary to represent 'country' and so jade is a component of the name for the country of China - Zhongguo 中国. 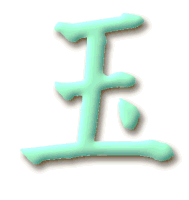 Jade as a character radical is used in a range of other characters such as 现 xiàn ‘appear’; 瑰 guī ‘precious’; 玷 diàn ‘blemish’ and 理 lǐ ‘principle’. The English name ‘jade’ comes from the Spanish ‘piedra de ijada’ ➚ from the belief that powdered jade was a medicine that combats kidney ailments. Jade in Chinese sounds the same as 愈 yù a character for ‘heal’ and this may be another reason that jade suits were made for the deceased and why jade is kept as a lucky charm to keep illness away. Jadeite is a sodium aluminum silicate (NaAlSi2O6) in the pyroxene group of minerals. It is quite rare and occurs only in low grade metamorphic rocks ➚ (sedimentary rocks that have experienced a short period of increased pressure and temperature). Jadeite tends to be light to emerald green in color. The main modern source of jadeite are mines in neighboring Burma. In October 2016 a huge block was found ➚ and valued at $180million. Nephrite is the other mineral considered as ‘true jade’ (zhen yu) and was used before Jadeite became available in the 18th century. Nephrite is a different mineral - a tremolitic or actinolitic amphibole ➚ but also metamorphic in origin. It has a more varied composition which gives a wider range of colors - when nephrite contains a lot of iron it can even be brown or orange. Nephrite is softer than jadeite and was mined extensively in the Kunlun mountains ➚ that form the border between Xinjiang and Tibet. Due to the variation of color with many bands and veins it is a matter of luck as to how useful an excavated block of jade will turn out to be. Unfortunately some 'jade' on sale is counterfeit and may be soapstone or other cheaper materials. True jade can usually be distinguished by its hardness (it can not be marked by a steel knife) and its coldness to the touch. “Thank you for your most helpful information!” Guizhou province. One of the most famous jade sculptures is the Jadeite Cabbage ➚ on display at the National Palace Museum in Taipei. A piece of jade was chosen that naturally grades from cream to dark green to match a real cabbage. It was expertly carved in the Qing dynasty. Hidden within the leaves are a locust and katydid and they symbolize female virtue. The exhibit is very popular with long queues forming to catch a brief glimpse of it each day. The Jade Emperor is the supreme god (玉皇帝 yù huáng dì) of the Daoist tradition. Emperor Zhenzong of the Song dynasty used a supposed mystical connection with the Jade Emperor to bolster his rule. Jade exemplifies all that is good and so is associated with the noble man (junzi ➚) of Confucian ideals. By legend it is considered as crystallized moonlight (a very yin substance). Many colloquial expressions have jade associated with parts of the body, often complimentary but with a sexual connection. The Queen Mother of the West (西王母 xī wǎng mǔ) is often shown by a jade pool. She was reputed to live in the Kunlun mountains - the source of jade. Confucius extolled the virtues of jade in this lengthy tribute. Modern Chinese Dushan jade sculpture from central China. It shows the variability of color within a block of jade. Here the artist has used the variation to exquisite effect. Jade was used as a tough stone originally for axes and knives in the Stone Age, as a superior alternative to flint. Thereafter its use became ceremonial and ornamental as although hard it is rather brittle making it unsuitable for fashioning weapons. Jade burial suit. Nanjing museum. Nanjing. Copyright Richard Wingfield, October 2017. Jade remains a prized gemstone and sculpted into wonderful jewelry and ornaments. Qingtian, Zhejiang; Shoushan, Fujian and Luoyang, Hunan are noted centers for working in jade. Citation information for this page : Chinasage, 'Jade - China's precious gem', last updated 28 Nov 2016, Web, http://www.chinasage.info/jade.htm.